The entry deadline for this program is Friday, June 3, with a late deadline of June 10. For more information on who should enter and entry requirements, visit: http://www.prnewsonline.com/PR-News-Top-Places-Awards. The winners of the Top Places to Work in PR Awards represent the organizations that truly value their employees. They focus on providing the ideal work environment that makes employees feel valued and motivated to do their job to the best of their ability. The entry process is simple and involves answering questions about an organization’s opportunities as far as growth, benefits, compensation, diversity and flexibility. PR agencies, corporations, nonprofit organizations, associations and NGOs of all sizes are eligible to enter this celebrated program. To enter online, visit http://www.prnewsonline.com/PR-News-Top-Places-Awards. 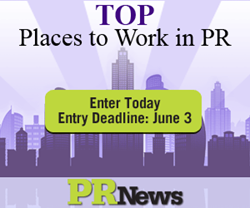 For questions regarding the Top Places to Work in PR Awards, contact PR News’ Marketing Assistant, Jessica Placencia, at jessica(at)accessintel(dot)com. PR News is a daily intellectual hub that serves the communications and marketing community at corporations, agencies and nonprofits. The PR News Group focuses on honing and growing PR practitioners' skills in social media, crisis management, digital PR, measurement, employee relations, media training, CSR and writing through its flagship newsletter, webinars, conferences, awards programs, workshops and guidebooks. With the launch of its weekly newsletter over 70 years ago, PR News has remained dedicated to supporting the growth of communicators all while keeping them abreast of the latest news affecting the industry. For more information, please visit http://www.prnewsonline.com.